All the tools you need to manage your data in a all-in-one service which works on computeur, phone and tablet. Everything you need in one service. High store volume for all the files. All you need to send or receive data. Share files in peer to peer, private or public. Manage easily your data as on your computer. Video and music streaming, online editing Office documents. A digital safe to automatically back up your important data in different data centers. The whole all-included service from 5,99€ per month only. Simplified transfers management thanks to the exclusive interfaces: quality and simplicity. Data sharing has never been easier. The Basic edition includes 400 GB of online storage space and 100 more GB for the digital safe. For more storage, upgrade to the Storage edition with 4000 GB of storage! Contact Seedbox support by phone, live-chat or email as soon as you need to get help from one of our advisors. 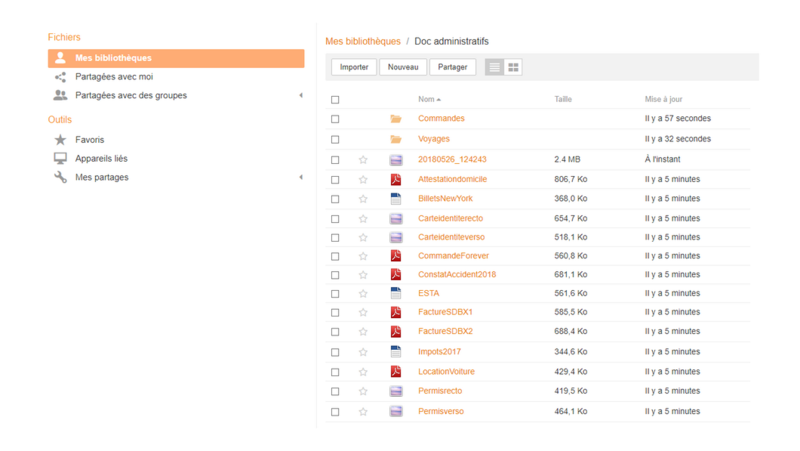 The online administrative console provides access to all you services in one click: use, manage and configure. But also benefit from specialized access to standard protocols. Protect your data with the Mobile device management feature which automatically back ups your photos and contacts in you digital safe. Our tools and services provides access to your data from any device even without an Internet connection. Synchronization is automatic and transparent. Intuitive interfaces, functions which are simple to understand and guaranteed performance. Share your data with the whole world through a high-availability peer-to-peer interface. 40 Gbps Network. Access or configure all you services through a single interface - do not need to be a computer specialist.